What kind of a printer should I buy? Printer Reviews – What kind of a printer should I buy? It is that time of year again, that demands the answer to the questions, what should I do with last years printer? Is it worth repairing, or should I buy a new laser printer, a new inkjet printer or a new colour laser printer? It is back to school, college, university or work, and the same questions remain, so hopefully, this will help you decide what to do! “What kind of a printer should I buy?” If I had a dollar for every time I was asked that question in the run of a month, it would likely purchase all my groceries! Well that being said, I understand the confusion in purchasing a printer. Regardless of whether it is for home or business, it can be a daunting task. Just the sheer number of printers available is one thing BUT the options they all offer is another. Plus you have to consider your operating system and whether it is compatible with the new printer! Here are two interesting videos that may help your decision. The Epson ET4750 has replaced the ET4550 checkout Amazon for the best price. So here I will try and filter what you should look for when purchasing a printer/or printer copier fax. 2. The second is do you NEED or do you WANT color? Sometimes a want is just that, and you never use what you think you wanted. Sometimes it is good just to sit down and figure out the cost of color. I did our daughters wedding invitations on a Canon color inkjet machine a couple of years ago, (it was a fun project) but it was not really cost effective. I figured with the cost of the ink and photo paper, London Drugs would have been cheaper. So like I said figure out what you need the printer for, and remember that sometimes our wants are just that, wants. 3. So now you have determined whether you need just a printer or a printer and copier, and determined how much printing per month, and if you need color. So let us filter machines. The industry standard is HP and Lexmark for Laser Printers (there are other don’t get me wrong here) I had a customer call and she was going to purchase a Xerox machine (which she did) but when she needed toner on the weekend she was out of luck because she had to order it thru Xerox, she called me wondering if I had stock…I personally like a Brother Laser Printer (just finished installing a Brother Printer Copier on my mom’s laptop). Great machine for her (wireless and network monochrome laser for less than 100.00) Fantastic deal for her all her needs. Toner cost is 60.00 and prints 2100 pages. For an office environment the more you pay for the initial printer, the less you pay for toner cartridges. I currently have a used Lexmark T650dtn printer for sale it comes with 2 trays, duplex, and network for $625.00 (includes full toner). The compatible toner cartridge I sell is $199.00 and will print in excess of 25,000 pages. So for a production machine it would be very cost effective. So my suggestion to everyone pick a printer you think you like or want and then check the cost of the consumables (ink or toner cartridges) for that particular machine. There awhile ago Future Shop had a color laser printer for $79.00 and it came with starter cartridges that did 250 pages each. The cost of each cartridge was $179.00, so you do that 4 times and was the printer really worth $716.00 to you after a month of use? Only you can answer that. Happy Shopping, and if you need any assistance or would like any questions answered, please call Anounce Printer Repair, our technician fixes them all. This is a question I hear everyday. At one time I would have just replied “Yes”, but not anymore. The reason, well it comes down to how much money you want to spend, as anything can be repaired, but do you want to pay the price to have it done. Most households can purchase a printer (whether it be an inkjet, monochrome laser, or color laser) for less than $200.00. Our in-shop rate is $55.00, for just labor, and if parts are required that adds more cost. So…do we repair printers? Yes, depending on the machine and what is wrong with it. 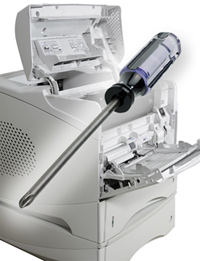 Anounce Printer Repair will tell you honestly over the phone if your machine is worth the drive to have it repaired. Hey some people can get very defensive, and think that we don’t want to help them. I am a consumer too, and I don’t know about anyone else but I don’t like to waste my money and appreciate someone telling me if something is not worth repairing, because I can replace it cheaper. Just so you all know, we make more money repairing than we ever would selling you a new printer…the markup on a new machine is less than $20.00. So after I pull my technician off a job to talk to you, and it takes 15 minutes to convince you to purchase a new printer, and then you go to Staples or London Drugs, how much money did I make? Nothing. So if Anounce Printer Repair tells you it is not worth repairing, don’t take it personal, just accept the advise and buy a new one, as we have just kept $55.00 in your pocket. If it was about the money we would have you drop off your printer, and take your $55.00 and you would then have to go by another machine, but hey I would be $55.00 richer. So please, I am not being mean, I am just trying to help you save some money. What kind of a printer do you recommend? Well guess that is for another day, and YES I do have an opinion on that too. Have a great day here in Victoria BC. We are here to help with all your printers & plotters. Printer Repair & Plotter Repair in Victoria BC, is there really such a market anymore? Today I heard that my main printer parts supplier is closing their distribution centre on the west coast of Canada. I am saddened by the fact that I now have to talk to someone in a different time zone, and that the cost of my parts has just increased because of the added cost to ship printer parts across the country. So here is my thought or question of the day. Does anyone repair their printers? If printers are being repaired why is my west coast distribution centre closing? Oh, this isn’t the first of my suppliers to pull out of the west coast. We here on the west coast are the most environmentally friendly in Canada, so why am I going to Ontario or Quebec for my parts? Oh, that being said that begs another question, are we really the most environmentally friendly, or do we just talk about being environmentally conscious? At the end of the day, it is back to PRINTER REPAIRS. Is it worth the cost and that is up to you the consumer and to me the technician? I had someone call me for a part for an HP DesignJet, and yes I can purchase the part but the ETA is anywhere from 10 days to 60 days. If you have a production plotter like this you cannot have downtime of 60 days, as work just doesn’t work that way. So it is difficult to get parts, and difficult to have a client willing to wait up to 60 days for parts, so they go purchase new. So as my printer parts suppliers all close on the west coast, I can still go to Ontario, Quebec, and China to purchase supplies, and pay to have an item shipped across the country or the globe, so yes Anounce still tries to repairs printers in Victoria BC. Call Anounce Printer Repair to troubleshoot error codes on your printers, and remember Anounce is here to help, call 250 474 1901.